Today, Venezuelans woke up to a violent, macabre image in their newspaper: the word "Censurado" splashed across the front page of El Nacional. This is the product of yet another mistake from the chavista judiciary, stemming from at least two separate rulings. 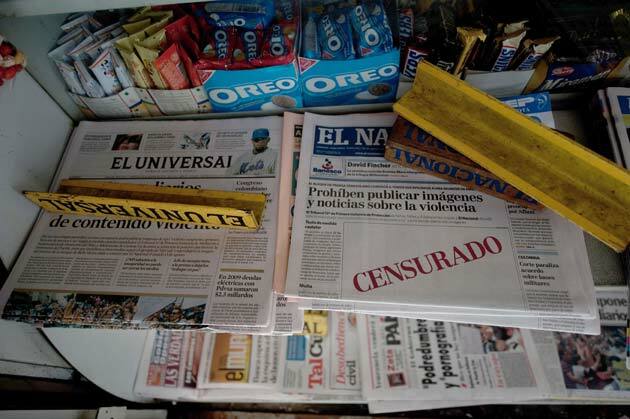 One ruling forbids all newspapers from publishing "violent images;" another, more sweeping one, forbids El Nacional in particular from publishing "images," "advertisement" or any "news item" that could be deemed violent and harm children and adolescents. The broad-sweeping moves have deservedly won widespread condemnation, including one from the chavista editor of Ultimas Noticias, Eleazar Díaz Rangel. But the attitude of Panorama, one of the country’s most widely read newspapers, has been a mild shrug of the shoulders. Panorama mentioned the Court order at the bottom of its front page. However, it merely says newspapers are forbidden from publishing violent images. No context is given, no editorial opinion accompanies it. There is no mention of the fact that the order against El Nacional is much broader. The op-ed page today makes it seem as though it’s business as usual. Panorama is my hometown newspaper. Through its long existence, it has been owned by the wealthy Pineda family. It’s been around for such a long time that many maracuchos will substitute the noun "newspaper" for "panorama." Caraqueños are usually surprised to learn it is one of the country’s most widely read. So this touches a nerve for me. A few years ago, Panorama decided to cast its lot with the government, becoming the nation’s main privately-owned-yet-openly-supportive-of-the-government newspaper. Its relations with the chavista administration are so cozy that upon the death of the paper’s previous owner, Esteban Pineda Belloso, Hugo Chávez himself called him an "exemplary" Venezuelan. Yet Panorama’s silence on this issue is curious because, for many years, it has traded in exactly the type of journalism the Court order wishes to clamp down on. For example, check out their Special Edition "Muerte 2009" attachment, chronicling the year’s most heinous crimes. Routinely, the crime stories the paper highlights are accompanied by bloody photographs. Why just today, a story about a man dying on the street is accompanied by a picture of the man’s body … in the morgue! Obviously, Panorama knows that the standards applied to them are different than those applied to everyone else. Those are the benefits of treating the government with a velvet hand. That, and a wealth of PDVSA advertisements. I don’t know if Patricia Pineda, the paper’s current Director, is in Maracaibo, taking a vacation in Miami or somewhere else. She may have learned a lot at Harvard, Georgetown and the Sorbonne, but she must have skipped the class on journalistic ethics. It is Panorama’s right to line itself with the government, just as much as it is El Nacional’s right to be in the opposition. But on this issue, newspapers have a moral responsibility to speak up. The Court’s broad orders clearly open the door to censorship, and whether she agrees with this or not, her paper needs to say something. I guess it’s as they say, "el que calla, otorga." By going along with this travesty she has let her readers and her journalists down. The silence of her newspaper on this issue is shameful, and she should be brought to task for it.